It has been 14 years since the tragic events of 9/11 happened. Everyone in America knows exactly where they were when they heard the news. For me, I was in 7th grade social studies class when the principal made an announcement over the speaker that all after school activities were canceled. Everyone in our class looked outside and saw beautiful, sunny weather and we didn’t understand why we weren’t allowed to go to our sports practices after school dismissed. Our teacher was very distraught and told us what had occurred. We were just learning of the attacks and we weren’t sure what exactly happened and why. I remember my mom picking me up from school and she was crying. We immediately went home and watched the news. We couldn’t believe all the heartless acts that took place that day. My mom was in the Air Force and would often have to go to Fort Hamilton (in Brooklyn) several times a year. We would always go with her. We were lucky enough to go to the World Trade Center the year before 9/11. I remember looking out from one of the highest floors with my brother and couldn’t believe the incredible views of New York City. There was also a fun helicopter ride inside that gave you a simulated tour of the Big Apple. There was just so much to see and do in the Center and it made me feel excited to have visited such an amazing place. I then knew I wanted to visit the World Trade Center again, but didn’t know I would never be able to. Shortly after the attacks, my mom deployed overseas for several months. My grandparents and parents are retired military and my husband and brother-in-law are both active-duty military, so I have always had a very strong respect for our service members and for all they do for our country. In November 2013, Ryan (my now husband) and I took our dogs and went to visit our friends in NYC. Ryan had never really been in the city besides going to Yankees games, so I was thrilled he was finally going to see it. We went to Times Square, Bryant Park, and several other sites. Our favorite, although the hardest to visit, was the 9/11 Memorial. We saw the new World Trade Center and looked at the beautiful memorials that were built in honor of those lost. It was so sad to see all the names, but it is comforting knowing that all of the victims are recognized and will never be forgotten. We hope to see the new World Trade Center and the National September 11 Memorial & Museum when we visit the city this December. I noticed a nice touch that Fox News did on their programming today. Instead of having breaking news bulletins scrolling across the bottom of the screen, the names of the victims who were lost are being shown. What a touching tribute, Fox News! Another remarkable tribute was what the weather did for New York City yesterday. 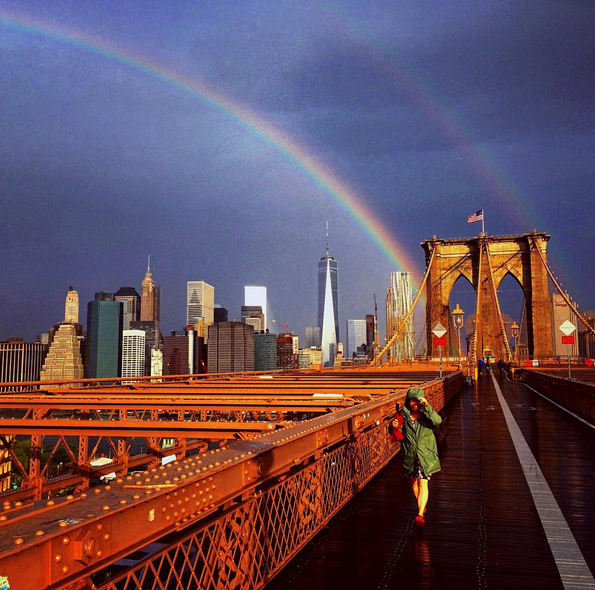 Several people captured the shot of a bright, shiny rainbow over the city, touching on the World Trade Center. Below is one of my favorites that I saw posted Instagram by @flowkradd. A beautiful rainbow shines bright over the World Trade Center the day before the 14th anniversary of 9/11. Photo captured by Tim Rice (Instagram: @flowkradd). We will never forget the victims who were lost in the Pentagon, Shanksville, and New York City. We will never forget the heroes who first responded to the tragic sites. We will never forget the service members who fought for our lives. We will never forget 9/11. God Bless America. Could 9/11 have been different if Hurricane Erin didn’t take a strange U-Turn on that morning? We all remember where we were and what we were doing on the tragic day of 9/11. I was in seventh grade. I remember sitting in my ninth period Social Studies class, third row, second seat, when I found out. The afternoon announcements came on, and our principal said all after school activities were cancelled. The whole class was confused because the weather was so nice out. Why would sports be cancelled? I was also a swimmer, so I practiced inside and was even more confused of why I could not attend practice that afternoon. After everyone shared their confused looks, our teacher told us what happened. He said two planes hit the World Trade Center towers. That was about all he said, but we knew more had to have happened by the look on his face. The bell rang and everyone ran to their lockers to pack up and go home. On my way to my locker I overheard my friend’s mom, who is a French teacher in the school district, ask her “Julie, did you hear what happened? !” She pulled Julie to the side to tell her. I was still confused so I just packed up my stuff and went outside to my mom’s car and got inside. She finally told me everything that happened, including the falling of the towers, Flight 93, and the crash into the Pentagon. She also told me how many people were dying and injured. We both were crying. On this tenth anniversary of 9/11, I was looking up information on that day and found a YouTube video that said there was a hurricane very close to the coast, and it took a strange U-turn the morning of 9/11. If it hit the big city and its surroundings, could 9/11 have been different? Would flights have flown out? Would the city have evacuated people? You can decide what you believe after watching the video posted below. I think, based on the NOAA radar maps, the hurricane was a possibility. It could have easily hit NYC and all the northeastern United States. The only tricky thing about this is – why did no news networks announce this prior to 9/11? If you compare it to the coverage of other hurricanes (as shown in the video) not much was said. What do you think of this video? Do you think it is true? If so, do you think it could have made an impact?